And there it is. The Graphic Design flubs I was warned about in class . Well the hardcover collections collect everything up to the end of issue 50 already. Man, they caught up fast even if this one doesn't come out till early 2018. Now the hardcovers only have to collect from issue #51 to present, including the Bebop/Rocksteady mini, Universe so far, and Dimension X. Definitely buying the Inside Out directors cut. I've recently been thinking about buying the Universe TPBs so as to have the back up shorts all told as whole stories, so hopefully they keep these coming. That would be great to eventually have some IDW masterworks volumes released that collected more issues in a single volume. Like a big ol' omnibus with a sewn binding. I think if IDW keeps up the pace we will have 16 volumes collecting up to issue #100. I am not complaining because that is awesome to have 16 HC volumes, means you have been successful. I even have some ordered and on the way. But would love to have the option of perhaps seven larger (but not to large) volumes rather than 16. I think this is far down the road though. Old Hob, Slash, and their crew have become a force to be reckoned with, and, when someone close to the group is kidnapped, the Mutanimals end up on an adventure more wild and dangerous than they could ever have imagined. Then, the Turtles return from Burnow Island to find unimaginable tragedy. As the family struggles to cope, an enraged Foot Clan prepares its revenge. Meanwhile, Casey prepares for a final showdown with Hun as the Purple Dragons run amok, and April has come into possession of an ancient scroll that seems to point to answers regarding the Pantheon. 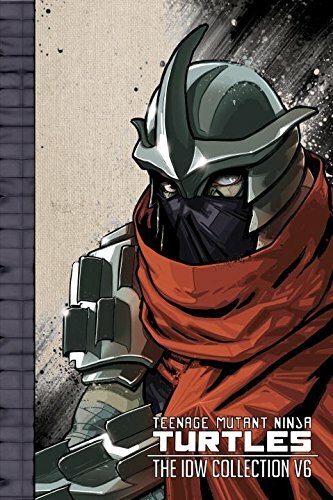 It all leads to a final showdown as Karai decrees a Gauntlet battle between Splinter and Shredder. Collects the Mutanimals mini-series, issues #45-50 of the ongoing series, the 2015 Free Comic Book Day issue, and the Casey & April mini-series. very awesome! i've been waiting for this to finally be announced! so i'm thinking Vol. 7 might possibly be feature Michelangelo on the cover? So what are the cover thus far again? I think something like this..
Is it just me or does the spine for Vol 6 pic above look very similar to Vol 4 spine? Last edited by TurtleWA; 06-01-2017 at 11:08 AM. These hardcovers collect approximately 15 issues right? It gets a little confusing for me thinking that far ahead with vol 8, but still fun to consider. I would be okay if B&RDE got left out and TMNTU 7&8 got put in. But then it's looking like a TMNTU collection, which already exists with two volumes. Also what about the recent FCBD issue? I guess it's best to save that issue for when the mini is collected? So vol 5 will have the TMNT/Ghostbusters crossover. I like that idea. Haven't had a chance to read it yet. Last edited by TurtleWA; 06-01-2017 at 12:03 PM. i'm very curious how they'll fit in the stories from Tmnt: Universe into the IDW Collection. i can't see them leaving those out for a separate set of collected HC books, since 'the war to come' directly ties into the scene with Bishop and Darkwater in issue #65. Hopefully the Christmas issue isn't in Volume 7. Pepperoni and Agent Bishop's roles are small, but still make more sense after B&RDE and Universe 1-4. Maybe they could put some shorts there to fill it out? "Inside Out" comes out to be 20 pages, so that would work. if and when they get up to the Tmnt:Universe stories, i'm very curious to see how they fit in with the regular Ongoing series. Ah, now there's a thought, a pretty good one too. I didn't like the idea of skipping TMNT:B&RDE and TMNTU The War to Come just because of space limitations, but the back-up would probably fit nicely. Makes sense to be curious especially when wanting to replace your tpb collection. Nope, never read any Ghostbusters comics. I was only saying if IDW had to cut something I prefer B&RDE cut over TMNTU. But I think IDW can figure it out eventually so everything gets a reprint in HC format. Which is great for us fans. HC are just so cool when done well. Last edited by TurtleWA; 06-01-2017 at 02:25 PM. if anything they might just have to not be so rigid with the 15 issues per HC book. they just have to adjust the price accordingly depending on how many issues were contained.